Wakefield head coach Chris Chester. Trinity boss Chris Chester believes that Wakefield’s performance against Warrington Wolves shows that his team are not far away from being regular top-four contenders. 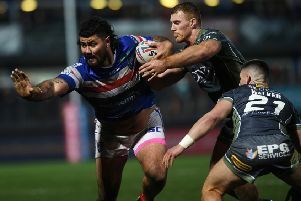 Huddersfield Giants’ 22-12 defeat against Catalans Dragons in Perpignan on Saturday evening meant a fifth-place finish for Wakefield for the second season running. And Chester says he knows the key areas where his team needs to improve, in order to start finishing higher up the ladder. “We showed tonight that we are not that far away from being a top-four side,” said Chester. “We know where we need to strengthen, we are lacking that little bit of quality and composure when we get the ball. Chester admits that Wakefield must recruit well during the off-season in order to fulfil their ambitions in 2019. The Trinity chief feels that his team need to add more quality to start challenging the more established Super League sides. He added: “We know exactly what we need to do - we need to bring some more quality into the club. “With quality, it means you have got to spend a lot more money than we are at the minute. “It is challenging in that respect but it is also very rewarding as well. With the salary cap set to rise - along with the promotion of London Broncos or Toronto Wolfpack - Chester feels that next season will prove to be even tougher. He said: “I have really enjoyed this season but we know again next year is going to be even tougher. We have just got to be really smart with the recruitment. “I am pleased with the season but I am disappointed that we weren’t in and around the four. “We lost too many close games, we want to turn that around next season. "But like I say, it is just that little bit of quality and game management that we have lacked. "We have got the makings of a very, very good rugby league side and we have got to be proud that we have given every single team a game."